PM says without global unity Paris terror will only increase, calls on Europe to support Israel in the struggle it is suffering as well. Prime Minister Binyamin Netanyahu on Monday met with leaders of the French Jewish community in the wake of the horrific attack on a kosher supermarket in Paris last Friday, in which four Jews were murdered by Islamist terrorists. "First of all, I would like to thank you, leaders of the French Jewish community, for the warm hospitality," Netanyahu said. "Yesterday’s event in the La Victoire synagogue was emotional." "I was also moved at the meeting with the bereaved families. I embraced the two brothers and I told them that I understand their feelings very well and that the entire Jewish People embraces the families. This was a moment of genuine Jewish solidarity," said the prime minister. Commenting on the two other attacks in Paris last week, including the murder of 12 people at the Charlie Hebdo headquarters and the shooting of a policewoman, he said "the visit to Paris was also a moment of general solidarity with humanity. As soon as the security problem was resolved, thus allowing me to come, it was natural that I come here, it was important that I come here and therefore I came here." According to an Israeli official, France didn't want Netanyahu to come even while it didn't provide a reason for preventing him, and after deciding to come anyway Netanyahu was told that Palestinian Authority (PA) Chairman Mahmoud Abbas would be invited too. "There is great significance in what the world saw, the Prime Minister of Israel marching with all the world leaders in a united effort against terrorism, or at least in a call for unity. This is something the State of Israel has been saying for many years," said Netanyahu. He added "this is what we are saying here today with one simple addition: If the world does not unite now against terrorism, the blows that terrorism has struck here will increase to a magnitude that can scarcely be conceived; therefore, I hope that Europe will unite. I hope that it will also take action. Israel supports Europe in the struggle against terrorism and the time has come for Europe to support Israel in the exact same struggle." 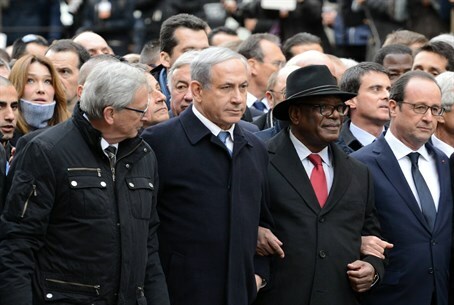 Netanyahu, along with other Israeli leaders who flew to France, came in for criticism by Otzma Yehudit head Dr. Michael Ben-Ari for not showing the same interest in cases of Israeli victims of terror, accusing them of leading Israel down the same path as France.